Being a good hitter starts with baseball batting training, and lots of it. Because hitting a baseball is one of the hardest things to do in all sports. If you are a serious player and play against good competition, then you know what they are talking about. Hitting is a hard thing to do. So to improve your hitting let's talk about some training. When I’m talking about batting training, I’m talking about getting you into baseball shape and improving your flexibility and your bat speed. If you are looking for hitting or batting drills, then we have those at Batting Drills. There are some good hitting drills there, but here we want to make to you faster, stronger and more flexible. And I’m mainly talking to players 13 or 14 and older. If you are younger than 13 you should be spending all your practice time swinging the bat. The more swings you get at the younger ages, the better off you will be. Baseball batting training will come soon enough for you. Now let’s move onto baseball batting training. Let me ask you a question. Have you ever heard of a medicine ball? OK, you are going to either love or hate the medicine ball, because they are a great training aid for improving your bat speed. For this exercise you will need a little room to throw a medium size medicine ball. Probably an eight pound bouncy ball will work the best. Start out by holding the medicine ball in the air just like you would a bat. Your hands and arms are tucked around your head, just like you are ready for a pitch. Now swing the ball around just like a bat, and when you have gotten to the point where the bat would meet a baseball, then throw the ball down against the wall. Do this drill about 10 times, rest, and repeat. in near your stomach.Now swing the ball from side to side, going as far as you can go. This really strengthens your twisting motion. Swing it to one side and back. Do these 10 times, rest, and repeat twice. These are great training drills. To help strengthen your legs and get more power in your swing, get a little heavier medicine ball for this baseball batting training drill. In this drill you will begin by holding the ball with your hands underneath it. Now squat and then jump up and throw the ball as high as you can. Three sets of 10 will probably wear you down. We need to add another drill that will strengthen the whole body, but especially the leg muscles. The name of this drill is burpee. In my younger days we called a drill very similar to this drill a squat thrust. This drill can be a whole workout by itself. After doing these for a few short minutes you will be ready drop. There are no training aids needed for this drill. And this drill can be done inside or outside. position with your hands in front of you. 2. Kick your legs back behind you to a push up position. 3. Quickly return your legs to a squat position. 4. Now, from the squatting position, leap straight up into the air as high as you possibility can. Start out doing these for a minute on and three minutes off for five repetitions. Doing the burpee three times a week will get you in shape fast. Each week try to add thirty seconds to the routine. If you would like to add a variation to this drill, then once you kick your legs back go ahead and do a push up. After the pushup once again return to the squatting position quickly and then jump high. You may hate burpees, but they will tone your whole body. This last baseball batting training drill is taking a heavier bat than you typically use, and take 100 swings a day with it. This drill will develop your muscles and at the same time help your swing mechanics. If you get tired take a break. It is important when doing this drill that you use good batting mechanics with every swing. Practicing something wrong can be very harmful to your performance. There are many other baseball batting training drills that can be found on the internet. The few I offer here are some of the best training routines for hitting a baseball. But I know that after a few months you may want to try some new drills. 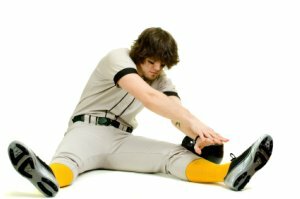 Just be sure and to look for drills that will allow you to keep your flexibility. "BrianMac Sports Coach - provides advice for coaches, athletes, sports science tutors and students studying sports related qualifications on topics relating to exercise physiology, successful coaching and athletic development."